Lumbar and cervical spinal decompression is also called traction. Lumbar or cervical traction or decompression devices and techniques vary greatly. All are centered on providing a pull along the spine. This is designed to gap each spinal segment thus decompressing all of the joints in the neck and back. The decompression is designed to relieve excess pressure on the disks, stretch soft tissues and most importantly to open up the spaces in the spine where the nerves come out. Decompression can be helpful to different patients for different reasons. Unfortunately, not every condition responds perfectly to spinal decompression. Often when applying any decompression technique your physical therapist will first trial a manual decompression technique using his or her hands or a traction belt. This will allow them to determine if you respond favorably to the technique. They may then go to a traction/decompression device which is pneumatic or mechanical to apply more consistent prolonged pressure. Again, you will likely be trialed for a short period to see how you respond. Hopefully, if your therapist feels that traction is right for your set of symptoms, you will notice relief and decreased pain. If not your therapist may decide to adjust parameters, wait until your symptoms have lessened before trying again, or discontinue the decompression therapy altogether. As previously mentioned there are many ways to provide both lumbar and cervical traction. If your therapist determines decompression is the right treatment for you, he/she can help you learn the best way to receive these treatments. There are both clinic and home traction units for both the lumbar and cervical spine. You may have also heard of over-the-door traction set ups and inversion tables. These can all be useful tools when applied safely and correctly. Ideally, decompression techniques should only be performed after a formal and thorough evaluation from your physical therapist. Your therapist will follow an algorithm or decision tree which will help them determine if this treatment is right for you. They will also take the necessary steps to ensure you receive the treatment safely. If it is determined that you will benefit from long term use of decompression they can also get you set up with an at-home option. 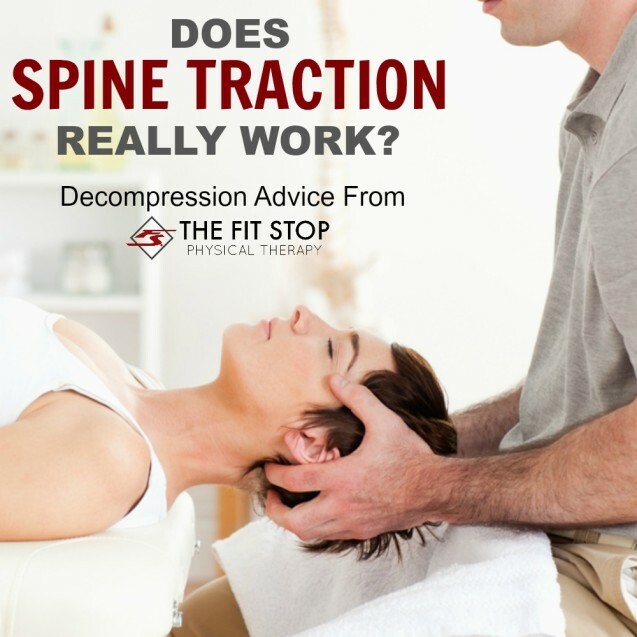 Your Fit Stop physical therapist is an expert at evaluation of the spine. Around 2/3 of our patients come to see us for back or neck related issues. We can help you to determine if spinal decompression is really safe and right for you. If you’re interested in more information or to set up an appointment with one of our spine pain specialists simply click on the link below for the clinic closest to you.